There are several ways you can customize the time pivot on a Timeline. You can adjust the timeline's scale and date range, set the timeline's time period indicators, and set other date preferences such as date and year labels. In addition to customizing a Timeline's time pivot, you can add theme-based data pivots and format the Timeline's layout and colors. Because a timeline is a time-oriented visualization of a roadmap, one of its main components is the time range represented by the horizontal timeline along the top. The scale of a timeline determines the time range that is visible on the screen. 1. Drag and drop the time slider above the timeline, or drag the handles on either end along the timeline to zoom in or out on the timeline by adjusting the time range that is visible on the screen. TIP: As you drag the slider, the dates at either end of the timeline change. 2. To more precisely set the range, click each date to select and exact Start Date and End Date in the date picker. In addition to adjusting the Timeline's scale, you can limit the date range of the entire timeline by setting its start and end dates. A timeline's date range determines two things: 1) The items that are included in a timeline (only those within the set date range), and 2) The outer limits of the timeline slider. 1. Click the Date Preferences icon on the far left of the timeline. 2. In the Date Preferences dialog, under Date Settings, select a Start Date and an End Date. NOTE: Roadmunk supports roadmaps that extend to 2050. Before setting the date range, take a look at how it affects the time periods you can display on the Timeline. Timelines are split into time period indicators that are labelled along the top and extend downwards as dotted vertical lines to form the timeline's columns. Today's date, if it's within the timeline's scale, appears as a vertical red line. You can set each time indicator in the timeline to a different period: Months, Quarters, Halves, or Years. Which time periods you select will depend on the scale of the timeline and the degree of detail that you want. 1. On the timeline, click the time period indicator you want to set. 2. 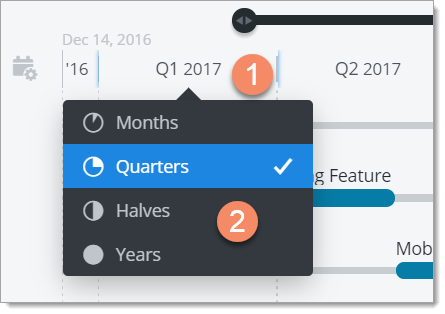 In the dropdown, select the time period: Months, Quarters, Halves, or Years. TIP: Mouse over each selection to see how it will affect the appearance of the timeline. A timeline's date range (see above) determines which time periods you can display on the timeline. You can set other date preferences in the Date Preferences dialog. To open the dialog, click the Date Preferences icon on the far left of the timeline. If your roadmap has a Fiscal Year-End, you can label the time periods in a Timeline using the Calendar Year or the Fiscal Year. If you select Fiscal Year, the items on the Timeline keep their Calendar Year dates but are plotted on the timeline in relation to the Fiscal Year. To set the label, select Calendar or Fiscal in the Date Label dropdown under Date Settings in the dialog. NOTE: If your roadmap has a Calendar Year-End, this option is not available and the dropdown will be grayed-out. 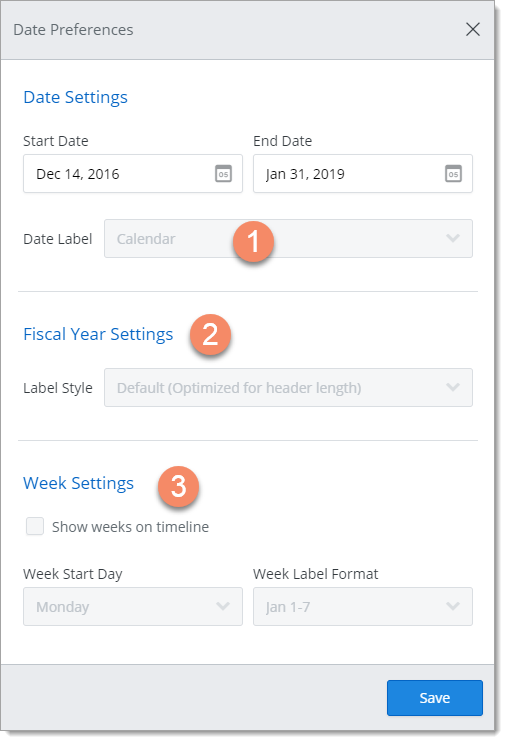 If your roadmap has a Fiscal Year-end and you choose to label time periods using the Fiscal Year, you can set the format of the labels (FY 2017-2018, FY 2018, FY18, etc.). To set the format, select it in the Label Style dropdown under Fiscal Year Settings in the dialog. If your timeline's date range is less than two years, you can choose to show weeks on the timeline. 1. Under Week Settings in the dialog, select Show weeks on timeline. 2. Select the day to start weeks on in the Week Start Day dropdown. 3. 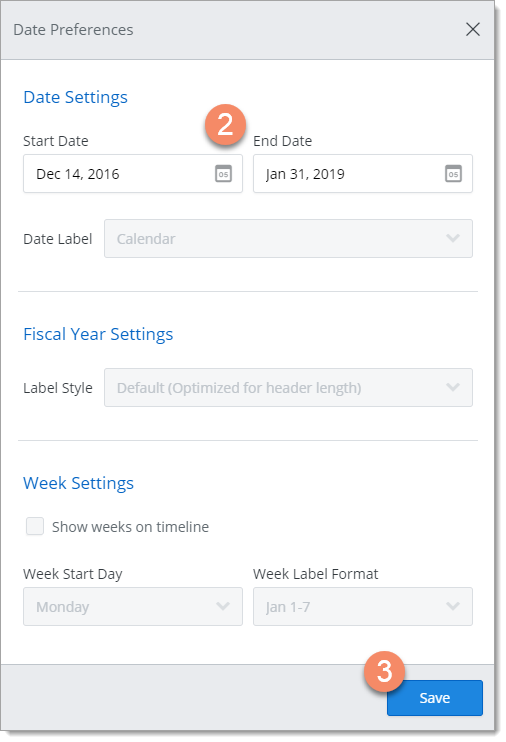 Select the format of weeks in the timeline in the Week Label Format dropdown. NOTE: If your the timeline date range is more than two years, this option is not available and the checkbox and dropdown will be grayed-out.